A view inside of the white Jeep Cherokee stopped in the middle of a Parkland intersection. A Washington state man who “snorted methamphetamine to lose weight” and caused alarm by waving an AK-47 at a busy intersection while shouting that President Donald Trump ordered him to fight “the lizard people,” was shocked with a Taser gun by police and is being mentally evaluated, authorities said. The 54-year-old man stopped his white Jeep Cherokee in the middle of the intersection on Nov. 25, at 108th Street and South Pacific Avenue in Parkland about 8:03 p.m., the Pierce County Sheriff’s Department said. A witness called 911 to report the suspicious activity. Washington State Patrol troopers arrived on the scene to find the man “waving around an AK-47” as well as a loaded Ruger .357 revolver. The man put the guns back in the car as troopers approached him—some armed with rifles of their own. Both a deputy and a trooper fired Tasers at the man, the sheriff’s department said. The man was then handcuffed. Medics at the scene determined the man was “heavily under the influence of a stimulant” and he was placed in a 14-day mental health evaluation hold. Inside the car was found a loaded Century Arms AK-47, the revolver, five loaded magazines for the rifle, a holster for the revolver and a wooden bat, the sheriff’s department said. There were 170 rounds of 7.62 mm ammunition loaded in the magazines for the AK-47. The cache of weapons was booked into evidence, the sheriff’s office said. Police released images of the small cache of weapons inside the car on the passenger's side of the vehicle. 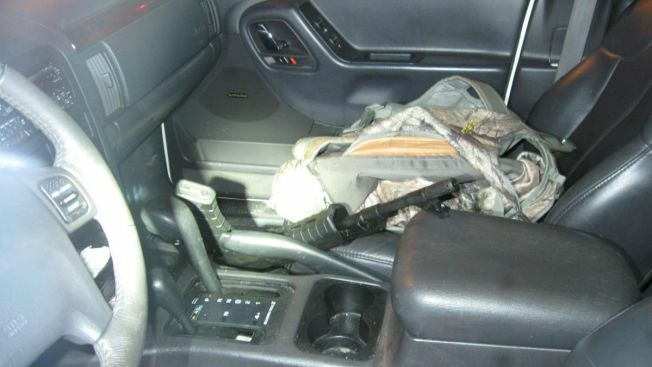 A long black rifle can be seen propped against the passenger seat, next to a camouflage backpack, rifle magazines and a silver revolver. It was unclear if the man would be charged with a crime pending the mental health evaluation.